First let me start by saying I spent wayyyy too little time in New York this trip. I used to be the type of Cali girl who said "I can only stand New York for 5 days max" but as much as I hate to admit it, this recent trip was just too short. Turns out a) I love Brooklyn and b) it's more fun doing stuff New Yorkers do than being a tourist (duh). Therefore I find this to be a measly representation of all Manhattan and Brooklyn have to offer, however this was all I could make it to in this trip. I will be back though, and I'm coming to hang with you @mishabarkton and @darling_clem! Flying to New York is way easier than flying your dog to Mexico! Get a nice piece of luggage that's comfortable to travel with as well, it'll make traveling with a pup easier. I swear by Away - just ordered myself the new Rashida Jones teal! - because Watson hooks right onto the handles and I can roll him flat (plus it fits all my stuffs, and I pack a lot of stuffs). Call your airline beforehand and add a pet to your reservation. All airline fees are different, Southwest is the cheapest at $95. Wear your dog out before you head to the airport! We normally play in the yard and go for a really long walk, I shoot for an hour if I can spare it. Play date is the best. Watson looOooooOoves bully sticks, so I also pop one of those in his Sleepypod for the trip. He normally carries a toy in with him too! One more doggie logistic - they recently passed a law in New York that you must have your dog in a bag on the subway. 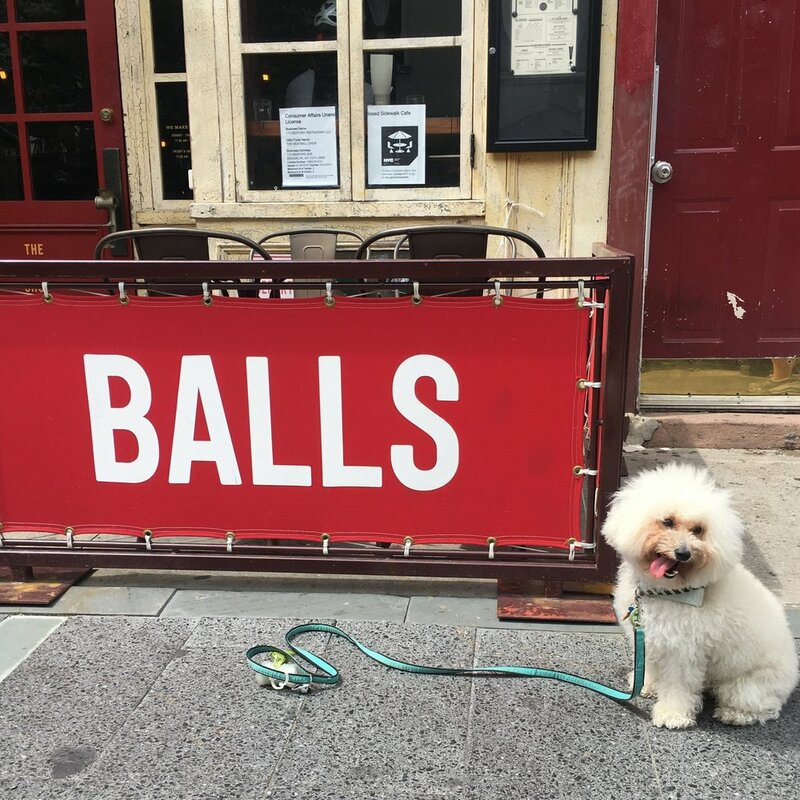 See New Yorkers hilarious interpretations of that law here, but bring a bag your dog will be comfortable in. Watson in a sushi bag was quite a sight, to say the least. The High Line - while we were sad to learn this was NOT dog friendly (come on New York, get with LA. If it's outside, dogs are allowed hahaha) but we're still so glad we went on this. We hopped on right at Artists and Fleas but this elevated park/walkway combo spans a large portion of Manhattan for you to peruse. Great views of the city and the High Line itself ain't bad looking. Museums - the Whitney and Met are favorites, but you really can't go wrong with any of them. Chelsea Market - love this food market! So much to eat and see here. You must stop at Dizengoff specifically for the hummus. You can’t bring your dog inside, but you can bring your food outside to your dog & eat in the park nearby! Shelsky's of Brooklyn - another Jewish deli, but this one you should go to for the fish rather than the bagels ;). Not dog-friendly inside, but lots of parks nearby to eat with your pup. Fornino - amazing rooftop views right on the water at Brooklyn Bridge Park! Great place for drinks on a hot summer night. They serve woodfire pizzas and a delicious kale salad too. Gersi - super adorable Italian joint in Cobble Hill. We sat in their backyard patio that was quaint and romantic. Everyone loved their food and we had leftovers! Pro tip: it's cash only. Smith St Bagels - my fave bagel we had in NY this trip! I put cream cheese (herbed if they have) and sliced cucumbers on my everything bagel and I must say, it tasted like victory. You really can't go wrong with bagels in NY though. White Maize - I'll admit this was my first arepa so I don't know how to rank them on a scale, but boy were these mighty tasty. Also you must get the Tequeños - fried cheese. Like a Venezuelan mozzarella stick of heaven. Smorgasburg - we didn't actually go to this one in Brooklyn because we have one in LA, but this is a definite must see for any foodie. Or anyone who likes food, which should be everyone. Flatiron Whiskey - I don't even like whiskey, but I love this bar / jazz club at the bottom of the Flatiron building. The building alone is a sight to see, but this bar is old world classy with a great selection. You can purchase a bottle of whiskey and they'll leave it with your name on it so you can come back to it whenever you want. Definition of class right there. La Colombe - there are almost too many good coffee options in New York to name them all, but I was pleasantly surprised to happen upon La Colombe on our tour of Soho. They make the "Pure Black & Tan" which is half draft latte and half cold brew that I cannot recommend enough. The perfect mix straight from a tap. Output - this club was very interesting, and from what I hear very typical Williamsburg. There were people in every sort of dress style, shape, size, color and gender. There are 3 levels: the first floor you enter on is very..interesting...hahaha. I related it to the club from the Matrix on a smaller scale, trans music, lots of people melodically nodding their heads, grunge vibe. I don't know if that's right haha but that's what I remember. Second floor you get to is the roof where we hung out for the most part. It was adorable and served rose in a can! But it's the smoking section so it's pretty much one big cloud of cigarette smoke. Worth it to be by the view though. Third and final floor is this mezzanine level club that was a bit more dramatic and elegant, with house music and a smaller dance floor. Henry Public - what an adorable quaint little spot in Cobble Hill! This English style pub has a live band on Sundays, delicious oysters and a great cocktail list. Swallow Coffee - first off I love the name of this coffee joint and yes I did want to swallow all the coffee once I tasted it. They had no cell phone and no laptop zones in there too, so people were reading books and actually talking to each other. It was pretty nice! 61 Local - another hip coffee joint right in Cobble Hill that was buzzing with people. Definitely worth a taste if you're in the neighborhood!